Who will be crowned at Miss Lady Lace’s Pinup Parade ! Event opens at 1pm and concludes at 5pm. Vendors, stage acts including top bands, free activities and loads more! A FREE community event. Miss Lady Lace’s Pinup Parade is vintage styled pinup contest celebrating inner beauty, and vintage glamour through women of all ages, and sizes. 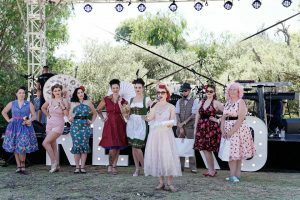 This is Perth’s most glamorous regular pinup contest, taking place at each The Vintage Collective Markets Perth Western Australia. The pinup parade is presented and hosted by Miss Lady Lace, renowned burlesque artist, pinup model and vintage blogger. The contest is definitely not your traditional beauty contest with judging criteria based upon the entrant’s confidence, posing, vintage styling and other fabulous aspects. 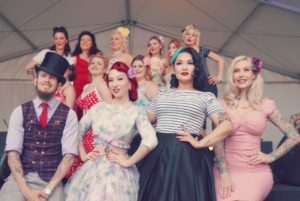 This pinup parade is for all vintage lovers, no prior experience is needed, and it’s goal at heart is to help women gain confidence through having fun on stage. Each lady has up to one minute on stage to dazzle the audience members, and judges. The Market Event is a select group of vintage, retro, pinup style business sitting along side artistic, small and hobby style popups. Including some ‘new’ items from ol’s skool brands. Food vans and steel bumper rides along with kids activities and loud and rockin’ tunes makes it a fun full day our without breaking the bank. Real retro lovers with a real passion for the 1950’s to 1970’s era we celebrate. No ‘wanna be’s’ here. To take part in the contest entries are open to any pinup girl 18-years or older, with no size, weight, age or height restrictions, as the contest is completely about celebrating women for all their beauty.Prior to the contest each entrant will receive an information pack, and personal assistance from Miss Lady Lace to help each entrant feel confident for the stage. Entrant’s gain confidence through their performance, gain friendship through meeting other like-minded women, and go in the running to win so many fabulous prizes! What happens after I submit my application to enter? Miss Lady Lace’s Team will contact you after receiving your Entry Form to provide further details and confirmation.